Check out that photo above. See anything you want to eat? Aaah, the convenience store. These stores are not so convenient for us healthy eaters who are trying to lose weight. We see the Twinkies, MSG filled Beef Jerky, and the ever present Doritos staring at us when we realize that we forgot to pack our snack. Number one rule of convenience stores - don't forget to pack a snack and you can avoid the pain of having to choose something. Of course, even Snack Girl isn't perfect and was looking for a snack when she shot this photo. 1. Bananas (yes, they were TWO for $1) - hurray! 2. Cheese sticks - I have written about these as a good snack here: The Benefits of Cheese Sticks. 3. Flavored Bubbly Water - grab this to avoid the Coke, Diet Coke, Monster Drink problem see: A Refreshingly Sweet Zero Calorie Beverage With No Artificial Sweetener. 4. Clif Kid ZBar - smaller than your regular bars these are a good 120 calorie alternative to most bars see: A Kid's Energy Bar for Lunch Boxes and Adults. 5. Small pack of Fig Newtons Hey, they are cookies but at least they have some fruit in them. A better choice than Oreos. 6. Ninety-nine cent packages of nuts If you can keep to 1/2 the bag you get 150 calories of nutritious snack. Give the other half to a friend. 7. Smart Food A one ounce bag is 160 calories which is better than potato chips, Doritos, etc. Popcorn gives lots of volume with fewer calories. 8. Coffee A cup of coffee with nothing added is TWO calories and it is roasted bean juice. If you drink it in moderation, go for this pick me up. 9. Baked Potato Chips and Pretzels about 160 calories per packaged vs. regular chips (280 calories). 10. Hard Boiled Eggs I found a package of 2 peeled hard boiled eggs next to the cheese sticks. These are nutritious and low calorie (140 calories for 2 eggs). What did I get? I got coffee and a cheese stick. No, it wasn't GOURMET, but it held me until I could get to my next destination. Bonus - I didn't go through the McD's drive-thru and get fries. What do you grab at the convenience store? I don't think I would pick up hard boiled eggs from a convenient store! :) Everything else seems ok!!! Love your posts! I also wouldn't touch the hard boiled eggs. Years ago I worked at Roy Rogers which had a salad bar. One of my jobs was to keep the salad bar stocked and one of the items was chopped eggs. These eggs came whole, in a very large bucket, soaking in a solution of sodium and formaldehyde. I'm sure to solution has changed but regardless who knows how old those eggs are and how safe they are? Probably a personal thing, but if I eat hard boiled eggs it will be at home after what I learned. I hadn't even thought of individual cheeses -- that's a great tip. Also, some convenience stores have pre-packed veggies and fruit. A few convenience stores near me have recently started carrying individual serve packages of hummus and those thin pretzel crackers - I think the whole pack is around 200 calories. Also wanted to mention that a lot of them carry yogurt cups now too. Although it's guaranteed to be the sweetened yogurt. Still better than a hot dog! What is Smart Food? Guess I'll have to look it up! I like to get cheese sticks at the convenience store. My husband likes to go for jerky and beef sticks. Stephanie, thanks for the hummus and pretzel cracker tip. Haven't seen those yet, but I'll be on the lookout! Fig newtons? I thought so too. A myth. Until I read the label. High fructose sugar is #1 and processed white flour. Nothing healthy about this and very little fruit. Oatmeal cookies are a much better choice, right? So I hear. @Carrie - Smart Food is flavored popcorn in a black bag - by Frito Lay - it is big volume and less fat than potato chips. @Melissa - yeah, I know about Fig Newtons - maybe I should have suggested an oatmeal raisin cookie - but they can be so HUGE. It is a conundrum - my point was that Fig Newtons are better than Oreos - they are not the best. Actually beef jerky (or any kind of turkey jerky, salmon jerky etc.) can be a good snack choice. Just read the ingredients. It's not an everyday thing but when traveling or hiking it comes in handy for some protein. You can even get Bison jerky. When flying to MN and back last week I got Hint water (0 calories, 0 fake sugar), mini turkey wraps (it was cut like sushi) and a roasted root veggie salad. All easy to take on a plane. From a little market...also got some small batch chocolate made in NY (dark chocolate). You can really do well at some of the little markets on the go. Hint water is expensive but kept my hydrated during my 11 hour journey home last Friday. Individually packaged large pickles :) High on sodium, but otherwise great! I,too, have enjoyed the Z Bars, but now am creeped out about the fact that one of the main ingredients is organic brown rice syrup which seems to be laden with arsenic. Your thoughts on this please. Great post. I always think of Michael Pollan's food rule that you shouldn't eat where you buy gas and try to stick with it for the most part. But there are exceptions to every rule and times when it's unavoidable, so love your positive spin on this. I would probably go for the banana, nuts and bubbly water. They usually have apples, too! Pumpkin seeds are also a pretty good choice. Lisa, (a.k.a. Snack Girl),I love your comments and the comments of others. Now, I have a question. I noticed a comment by"Leah 2 hours ago". Does this mean you have another "Leah"? I'm not surprised. There were 8 of us in my college english class. Lisa I think you are amazing. I love your blog. Thank you. I end up in a convenience store once a year or so. I can usually find better choices or I pack food. Recently, I went and was surprised to see small packs of each of the following: baby carrots, grapes, apple slices (with lemon juice to preserve them), hummus with pita, and some assorted packages of raw veggies with dip. There were also several fresh salads with dressing on the side. Each item had a sticker with the date packaged and sell by date. There was also a larger but still single serving fresh fruit bowl that looked really fresh. There were hard boiled eggs still in the shells in a two egg package. There were cartons of multiple brands of yogurt, including plain and Greek options, as well as small containers of not-fat milk. I was impressed and bought the carrots and fruit. The cashier said a lot of people are buying healthier food. This is a regional chain in our area, but I hope this is a trend all over. I was so happy that I might go back a little more often. The prices are what you would expect at a convenience store, but I was happy to be able to find healthier choices. @A - What I need to do is go on a road trip to check out the convenience stores through out the U.S.A. 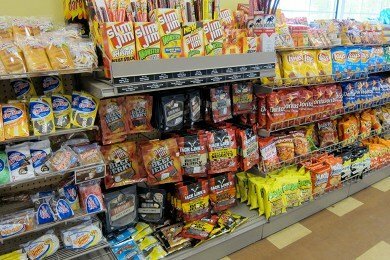 I wrote this in an attempt to address what you would find in EVERY convenience store - BUT, I have noticed many new healthy items in stores around me. Thanks so much for your comment! Our QT might be on the cutting edge but they have wholewheat bread sandwiches, chicken wraps and yogurt. I can usually get out of there before taking a second glance at the twix (double). This is such a helpful list. Sometimes I'll be at the convenience store just staring at the snack items because I have no idea what to get. The giant packaged sweets and overly large "snack sized" bags of chips are just everywhere!